Puppies and music can be a positive, therapeutic mix. Music can mask scary noises like thunder and fireworks, or upsetting sounds like a trespassing mail deliverer that put your puppy’s tail in a twist. It can even be helpful for separation anxiety or "pep up" a lethargic pet. The cadence of certain sounds influences the body’s natural rhythms and can speed them up and energize the listener, or slow them down to calm them. A hyperactive or fearful pet can be soothed with music or distracted with nature sounds like water running from a fountain. Lethargic pets that need to exercise can be energized with chirping squirrel sounds or fast music to get them up and bouncing to the beat. Puppies are even more sensitive to sound than people are. Puppy hearing is very acute, so it doesn't have to be loud music to have an effect. Sound causes physical changes in the body. Brain waves change with different kinds of sounds—music with a pulse of about 60 beats per minute slows the brain waves so the listener feels more relaxed and peaceful and shifts the consciousness into a more alert state. This rhythm also slows breathing, which calms the mind and improves metabolism. Even the heart wants to follow the pulse of the music—faster rhythms energize the listener as their heartbeat increases and blood pressure rises, while slower tempos simply calm them. Listening to music releases endorphins—natural painkillers that are produced by the brain—and reduces the levels of “stress hormones” in the blood. Sound therapy is still considered pretty new. One of the best-known applications is an ultrasound that uses the “echo” of high-frequency sound waves to take diagnostic pictures inside the body; doctors even use it to break up kidney stones with vibration instead of surgery. Over the last 20 years, music therapy has become a staple of the human mental health profession and is often used with troubled children and brain-disordered patients. It's also helpful for stress relief for people in general. Therapeutic harp music helps relieve pain that drugs don’t, soothes an emotional upset, and has become of particular help in hospice situations for human patients. One of the pioneers, Susan Raimond, also promotes the therapeutic effect of harp music in animals. The sound of harp music calms fractious dogs and cats and offers almost a natural sedative effect so that the upset animals become quiet, lay down and go to sleep. The simplest way to treat puppies with music is to put on music or turn on the radio. Choose the music you like—pets seem to respond best to music their owners enjoy because of the bond you share. 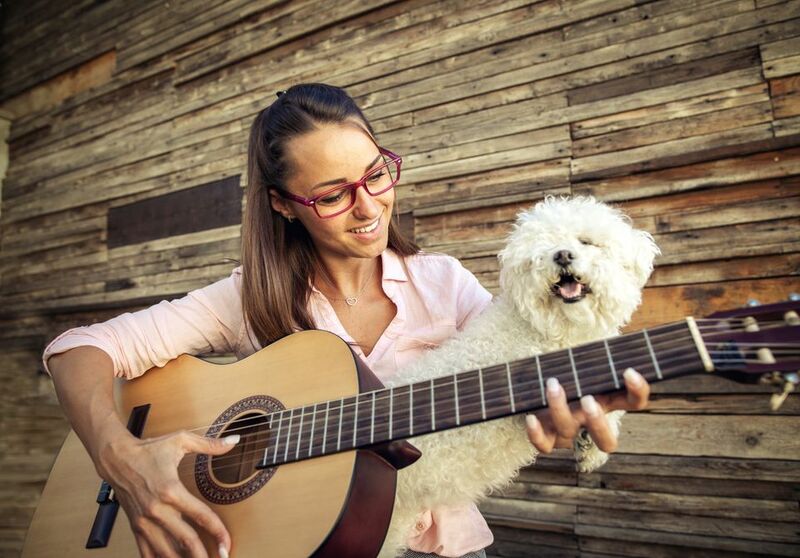 If you have a favorite music genre you often play, your pet will associate the sound with your presence—so playing that same music when they are alone will remind them of you and help ease problems like separation anxiety. Soft music with a slow, steady rhythm helps calm agitated puppies. It can help arthritic pets relax their muscles and increase their range of motion. It takes about 10 or 15 minutes for the music to take effect. Many pets enjoy Mozart or other classical music. New Age, soft jazz, southwest music with flutes and nature sounds, or even ballad-type country music can be soothing. The music should be melodic (not dissonant) and the tempo even and slow. You can play calming music anytime your pet feels stressed—even all day long as a background to help keep them calm. Turn up the volume to energize your pet. Moderate to loud music with a more driving beat energizes the emotions and can encourage lethargic pets to exercise and lift depression. Rock music, even the driving energy of rap may get a pet’s tail moving, but any up-tempo music from classical to contemporary has the power to energize. Again, play the music for at least 10 to 15 minutes at a time to get your pet in the right mood. Any music that you play on a regular basis helps your puppy identify that sound with your comforting presence. Even if your puppy doesn't suffer from separation anxiety, familiar music can help if you need to be away from home, because you can play your favorite music to help your pup feel better about your absence.